Sometimes you are so affected by life that you must stop and talk about it, paint it or write about it. Perhaps it’s someone you met or a place you visited. As the regional sponsor of the Scholastic Art & Writing Awards, Harris County Department of Education is proud to supply a venue for young artists and writers in grades 7-12. This year, professional art and writing judges donated their time to judge 8,000 inspiring art and writing student entries. Moreover, sponsors took on the charge to support students with recognition ceremonies and receptions. At one of our ceremonies, we were fortunate to meet a young writer who really inspired us. We’d like to share the story of Hajar Mohammad. 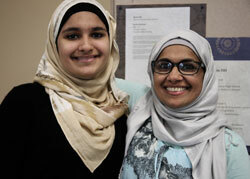 Hajar and her mother Nisa gain strength from one another, but faith gets them through the hard times. The eighth grader who attends Krimmel Intermediate in Klein Independent School District has published two books and writes about her life through difficult life topics ranging from domestic violence to racism. Her daughter Hajar is strong, insists Mother Nisa. She weathered her parents’ divorce, along with the negative comments on her religious customs. From the whispering about the henna that covered her hand to the jihab veil that covers her head and face, it’s not easy being Muslim in America. When Hajar writes, she begins with an idea or feeling that grows. The hurt is tolerable when she talks it out through words. “Benefit of the Doubt” is the name of the poem which earned Hajar the Gold Key Award recognition through Scholastic Art & Writing. Now her work advances to New York City for judging, and we’re wishing her the best. The young writer could be full of spite. Yet she prefers to give back to others by volunteering as a Spanish tutor after school. She studies hard. Next year she’ll be admitted into the gifted-and-talented program in high school. I wanted to crawl into a corner and hide. Maybe she was having a bad day. They all laughed and stared. Tears threatened to fall. Maybe they were laughing at someone else. Going home from school. A man pointing. My hair is covered.They think I’m oppressed.They think I’m responsible for 9/11. What can you do to support the regional Scholastic Art & Writing Awards in 2017? 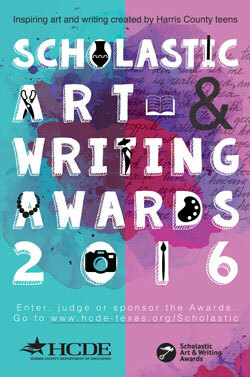 We’re counting on you to enter, judge or sponsor Scholastic Art & Writing. Beautiful poem by Hajar Mohammed, thank you. I love not only the difficult idea expressed, but also the language and lyricism, the careful crafting of words. Amazing work from a 13-year-old! Hajar, best of luck–and lots of fun–in New York.